Sikhs in the United States are getting more support from their lawmakers in their battle against bullying of Sikh students. Thirty members of the United States Congress signed letters in early October urging the U.S. Department of Justice and U.S. Department of Education to strengthen protections against school bullying, according to a statement by the Sikh Coalition. A majority of Sikh American students experience school bullying, according to a research by the coalition. Although severe bullying is a civil rights violation, very few Sikh American families actually report it to authorities. To bridge this gap, the new Congressional letters call on federal agencies to improve data collection for bullying incidents affecting the Sikh American community, according to the statement. During 2012 and 2013, the coalition says that it surveyed over 500 Sikh students, conducted focus groups with over 700 students, and interviewed 50 Sikh students in four states: Massachusetts, Indiana, Washington, and California. 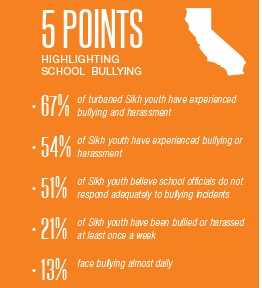 “We found that the majority of Sikh children, just over 50%, endure school bullying. And the numbers are worse for turbaned Sikh children. Over two-thirds, or 67%, reported that they are bullied in school. The word “widespread,” particularly as it applies to turbaned Sikh youth, is not an exaggeration. According to the National Center for Education Statistics, 32% of all students ages 12 to 18 report that they are bullied in school,” the report said. Clearly, the report goes on to say, the extraordinary rates of bullying Sikh American school children endure is not happening in a vacuum. “The period since 9/11 has been particularly difficult for Sikh Americans and their children. 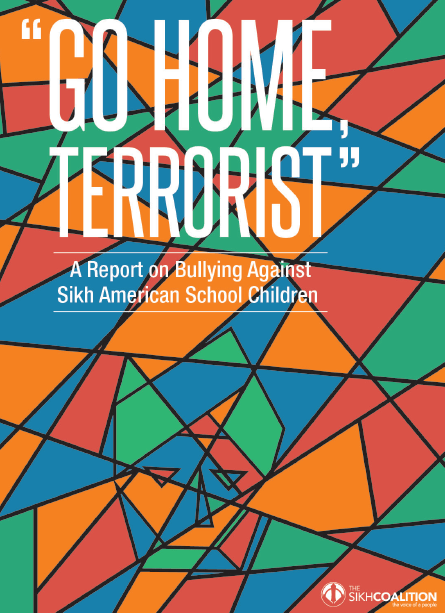 While Sikh children expe- rience bullying in the classrooms, their Sikh American parents endure astoundingly high rates of hate crimes, employment discrimination, and scrutiny at the nation’s airports. Brown skin and turbans have popularly become associated with terror. Crude popular culture stereotypes of terrorists4 and damaging media images outside the classroom have made their way into the classroom to the detriment of young Sikhs,” it says. The report notes that the government, teachers, and school administrators are not powerless to stop Sikh children from being bullied. It suggested that the United States Congress should prioritise passage of the Safe Schools Improvement Act to require schools to enact anti-bullying policies and collect data on school bullying for diagnostic purposes. “It is also critical that such data collection specifically include data on the rates at which Sikh children are bullied. The Federal Bureau of Inves- tigation (FBI) recently agreed to specifically track “anti-Sikh” hate crimes. The Department of Education should similarly track whether Sikh students are bullied and harassed based on their religion. In the absence of official data, small un- der-resourced community-based organizations like the Sikh Coalition shoulder the unfair burden of collecting data on bullying and harassment,” it says.